Today's TGIFF is a real oldie but goodie! Here's the story: More than 10 years ago (more like 15! ), I was the project leader for my son's 4-H club quilting project. I always made a parent attend with their 4-H'er, whether the project was quilting, knitting, or dogs. The mothers of my quilting project members decided they wanted to learn to quilt also. So we formed the "Quilter Mamas." Once a month, we met at my house, had lunch, and sewed a block on a Christmas quilt. Some of the Quilter Mamas had never sewed before, one was a third generation 4-H'er. So the plan was that we would sew on our quilts only at my house. Over the years, we gradually made many (but not all!) of the blocks in the quilt. We realized the reason for the Quilter Mamas was to be together, not necessarily to finish the quilt. Thanksgiving weekend, Joy called me and said she had her quilt finished. Did I know someone who could long-arm quilt it for her before Christmas? As quilters, you all know Thanksgiving weekend is NOT the date to request a quilt be finished by Christmas! Incredibly, one of our local long-armers, Frankie Shake, was willing to take on the quilt! And she finished it in record time. I showed Joy how to make Susie's Magic Binding during the Mystery Sew-Along at Ruth's Stitchery. 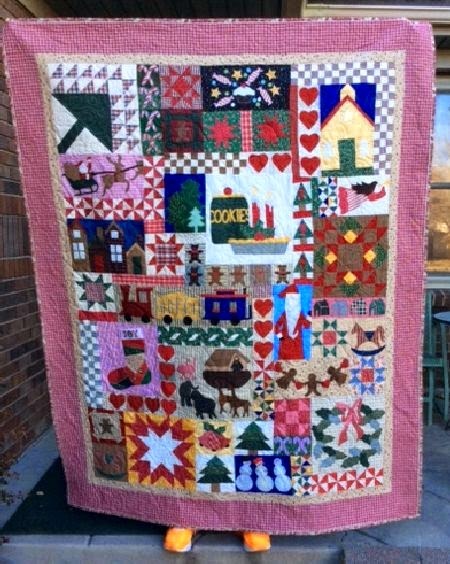 And here it is, the first Quilter Mamas Christmas Quilt! You may recognize the pattern from a Martingale Co. BOM project. I enlarged the photo so you can see some of the details of Joy's quilt. Plus the orange running shoes of the quilt holder! I'm so excited to see Joy's finished quilt, it make me want to quilt and bind my own! Mine is finished except for the last border -- maybe I'll get it finished this weekend? While uploading the photo of Joy's Christmas quilt, I realized I never showed you the December Jelly Roll Party project. This is "Basket Weave" by Pam and Nicky Lintott. I used a Moda Jelly Roll from several years ago in Christmas prints. I hope your own holiday preparations are well underway! That's a long time in the finish,, but well worth it! Yes, we need to see your now,,,some really interesting blocks. 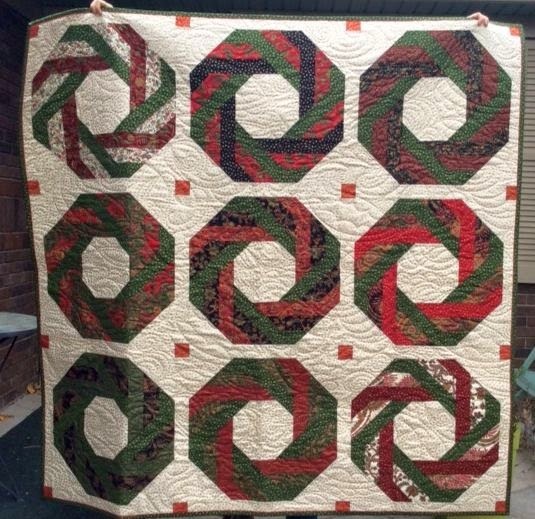 Love the jelly roll quilt... A great pattern for a Christmassy fabric. Ok I will ask....what is a 4-H re??? I enjoyed your story of the quilting Mammas, just like the old quilting bees which the pioneer ladies enjoyed. I started a "crafting bee" in my street and we meet fortnightly to sew, quilt, knit, or crochet and as you say, just be together in friendship. I loved seeing the finished quilt, I have been wanting to do one along these lines, as I get bored with an all over design very quickly and would enjoy all the random blocks. Where would be a good starting point do you think? How can I go about getting a copy of the Martingale pattern? What is the pattern name? The quilt is absolutely gorgeous and you "quiltin' mama's" did an excellent job. I just love it. Love the basket roll weave pattern. Looks great as Christmas wreaths. I have to Google what a 4H club is! Is it like scouts?